FRIDAY, Dec. 12, 2008 (Health.com) — Estrogen therapy is about the last thing you'd expect a doctor to prescribe for a woman with breast cancer: The hormone is famous for coaxing tumors to grow, not shrink. But in a new study, 1 out of 3 postmenopausal women with advanced cancer who were given a daily dose of estrogen saw their tumors slow to a stop, and in some cases, even get smaller. Remarkable science, certainly, but the best part is being able to avoid chemotherapy drugs in a group of women who may have awful side effects without much benefit in terms of survival, says Matthew Ellis, MD, PhD, an oncologist at Washington University School of Medicine, in St. Louis. "I don't have to give them chemo," says Dr. Ellis with evident satisfaction, after presenting the study Thursday at the annual San Antonio Breast Cancer Symposium, in Texas. "They're not curable, so the question is, 'What can I give them to make them feel OK?'" Why do these metastatic tumors react differently to estrogen than so many other tumors do? 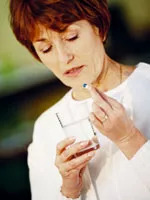 The 66 women in the St. Louis study had so-called estrogen-receptor-positive cancer (as do 75%–80% of breast cancer patients), and it had become resistant to the estrogen-lowering aromatase inhibitor (AI) drugs they were taking. That's why these women were up for an experiment in the first place (their options were slim), but their tumors' resistance to AIs is also what prepared their bodies for estrogen's return. "These tumors had reengineered themselves into a different kind of tumor," basically by learning how to grow without estrogen, explains Dr. Ellis. When these types of breast cancer cells were grown in the laboratory, introducing estrogen into the picture "confused the cancer like crazy." The estrogen caused cell growth to slow, suggesting it was safe for patients. And sure enough, the cancer in 30% of his subjects slowed way down as well. Unfortunately, the next phase for many of the women in the St. Louis study was watching the estrogen therapy eventually stop working—but they were generally able to start taking their old drugs again. "They can go back to the [aromatase inhibitors] they were resistant to because they've learned to tolerate it," says Dr. Ellis. Some of his patients, who had an average age of 59 during the study, even "flip back and forth" now between estrogen and aromatase inhibitors, he reports. Here's how Dr. Ellis set up his research: Half of the women took a very high dose of estrogen (fifteen 2-milligram tablets daily), the equivalent of the amount coursing through a woman's body during the first trimester of a pregnancy—with its attendant bloating, breast soreness, and nausea. Subjects in the other arm took about one-fifth of that dose—three 2-mg tablets a day. The low-dose group scarcely noticed any side effects. The estrogen put the brakes on both groups' cancers in about the same proportions, making a case for the symptom-free lower dose. So how do women know if they would be a good candidate for this metastasis-slowing estrogen therapy? To find out, patients need a pair of positron emission tomography (PET) scans, before and after a 24-hour estrogen-test treatment; the dye helps indicate if the cancer will respond to the therapy. The estrogen treatment isn't considered a good fit for women with a history of health problems including blood clots, heart attack, and stroke. James Ingle, MD, a professor of oncology at the Mayo Clinic, in Rochester, Minn., was encouraged by the new research. "I think it's great what [Dr. Ellis] has done." However, some patients may benefit from higher doses of estrogen, he says. Historically, women with breast cancer were treated with high doses of estrogen up until the 1970s, when the estrogen-blocking drug, tamoxifen, was found to be a much more effective way to slow cancer growth. "My question is, given the size of the study, has it really shown that there may not be some patients who don't require higher doses of estrogen?" says Dr. Ingle, who has done myriad research on breast cancer drugs. About 40,000 women die of metastatic breast cancer—or breast cancer that has spread to other parts of the body—every year, and researchers are hot on the path of new treatment options for women who are no longer benefiting from the available drugs. Other researchers at the San Antonio meeting discussed their efforts to develop drugs that fight metastatic breast cancer at the so-called distant sites, such as the bones and the brain. Affordability also becomes an issue for women spending years in treatment, often chasing the disease by using experimental drugs not covered by insurance. Indeed, says Dr. Ellis, another benefit of estrogen therapy is that it's a lot less expensive than chemotherapy.